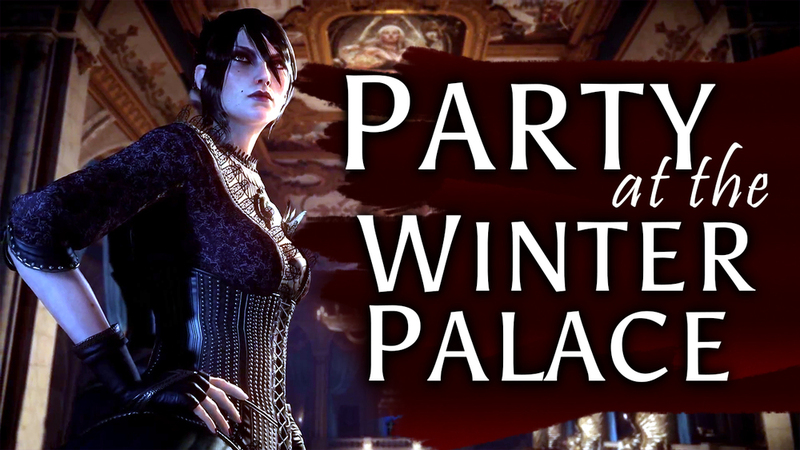 Costume Party at the Winter Palace. October 7th. Be there. Bioware released more screenshots on a location we'll be seeing for Inquisition: Halamshiral. Specifically, the costume party that we will be attending at the Winter Palace. Yes, because even though the nation is under chaos and disorder over the Civil War and blood's being spilled in the streets, why not have a party? According to level designer Chris Corfe, "the faction leaders are at a peace talk" all the while the Inquisition is hunting an assassin. Who is the assassin targeting? Does it have to deal with the Civil War or the Inquisition itself? Who is behind the assassination? Who cares? You just want to wear a dress, don't you? The most important thing is the party! The Inquisitor will be facing less combat, and more conversation. More quoted "social interactions" with the guests and nobles. Perhaps the same kind of party at Chateau Haine during Dragon Age 2, talking with the high echelon of Orlesian nobles and eating cheese that tastes of death, or perhaps similar to the party we threw during the Citadel DLC for Mass Effect, with everyone getting drunk and dancing gloriously in Shepard's apartment. What remains to be seen...as the developers are now tight-lipped. But like I said, October 7th. Bring a mask. So, the real question: who will be your date to this festive event? Leave your response in the comment section below. For me? It's only fitting that I'd bring such a gentleman to have my hand, to dance at such an extravagant occasion. Varric, forget Bianca. You need a real woman. The Lady Inquisitor beckons. Take care everyone, I'll see you next time.